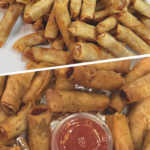 Thanks to our Chinese friends who introduced us to this dish, we have our very own Lumpia (Philippine Egg Roll Recipe). Lumpia is a versatile dish since you can eat it as a snack or during lunch and dinner. In a bowl, combine and mix the ground Chicken or Pork, green onions, water chestnuts, carrots, garlic, soy sauce, salt, and pepper until well distributed. Separate wrappers into individual sheets and lay the wrapper like a diamond. Put up about 2 tablespoons of Meat mixture in the middle of the wrapper. Fold the bottom pointed end of wrapper over filling. Fold side ends of the sheet inward and roll tightly into a log about 3/4-inch thick and 5-inch length. Wet the pointed edge of the wrapper with a dab of water to completely seal. Repeat with the remaining mixture. In a pan over medium heat, heat about 1 inch of oil. Fry lumpia in batches, turning on sides as needed, until golden brown and crisp and meat is cooked through. Remove from oil and drain on a wire rack set over a baking sheet. Best Served with Ketchup or Sweet and Sour Sauce or just a plain Vinegar. This video shows another recipe for Philippine Egg Roll.